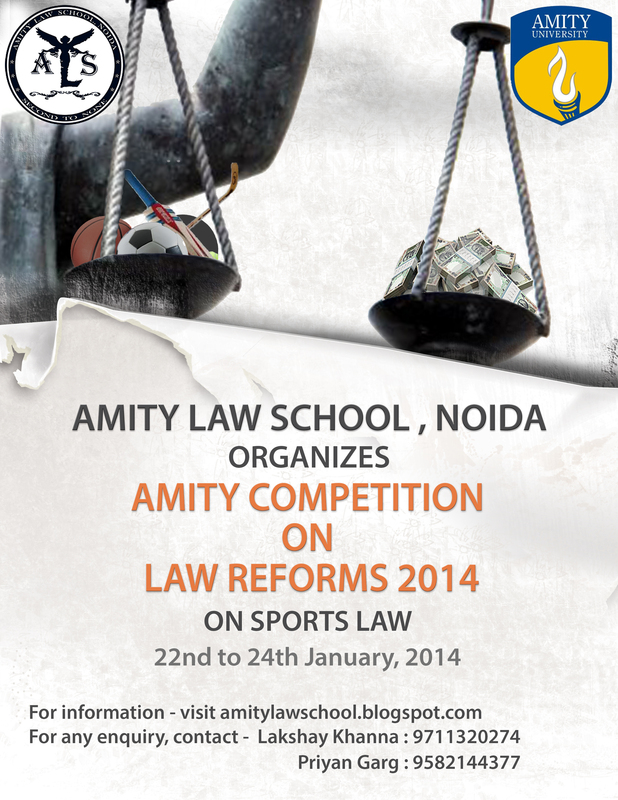 The 3rd edition of ACLR (Amity Competition on Law Reforms) is scheduled to be held from January 22nd to January 24th, 2014. The event concept is primarily focused upon issues pertaining to sports law and the competition will seek to integrate the academic potential, legal insight and team work amongst the law students. To register for the Competition, kindly confirm your participation via email to the Organizing Committee at [email protected] by the earliest possible. Also, fill the registration form and send it along with a Demand Draft of Rs. 3000/- per team in favour of ‘Amity University, Uttar Pradesh’ latest by January 10th, 2013 to Amity Law School, NOIDA, I-Block, Amity University Campus, Sector-125, NOIDA- 201303. Further developments and relevant information pertaining to the Competition shall be posted on the official blog, i.e., www.amitylawreform.blogspot.com. Download Rules for ACLR, 2014.